If you’re not sure where to start, you can actually buy packs of seeds specially selected for bees. Just Google “honeybee seed mix” and you’ll turn up tons of options like this one. Have an Old Fashioned Garden. Bees do best with less showy blooms. Big, double blossomed flowers actually give them less pollen for their effort than a simple marigold or daisy. Mix in plenty of single blooms with the more dramatic ones and the bees will flourish. They also get less from plants that have been hybridized and bred not to make seeds – which is the case with a lot of the vegetable seeds on the market. If you can get ahold of heirloom seeds for your vegetable garden, you’ll be helping the bees and also saving yourself money next season when you don’t have to start from scratch. 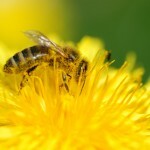 Plant for Prolonged Flowering: If you can manage a mix of plants that will bloom early, over the long Summer and then into Fall, you’re giving bees their best chance to survive with a long food season. Your Easter Hyacinths and early blooming crocuses will give way to Summer colors and then, in the Fall, bees can gather pollen from zinnias and sedum. Let Veggies Flower Too. At the end of the season when your vegetables have been harvested, leave the plants standing and they’ll flower enough to give bees a late-season boost in their food supply! Your end of season broccoli plants could help tide the bees over for Fall. Bees Like a Drink too. Leafy vegetables that collect dew, water features, freshly watered plants and bird baths all provide a welcome refresher for honeybees. Putting some decorative rocks or reedy plants in the water gives bees a perfect landing and launching pad for their beverage pitstops. Every Bit Helps! Even if you don’t have a lot of space, a window box or a planter on your steps can make a meal for your local bees. Sponsor a Hive. You might not want the bees coming home to your yard, but community gardens across the country are providing homes to shore up the honeybee population. The Honeybee Conservancy has created a program for people to contribute by sponsoring hives. Read more about ways to contribute and how this helps here!